Emery Robertson, counsel for Cummings, confirmed to SEARCHLIGHT that he has responded to the January 17 letter sent to him by Grahame Bollers, on behalf of the Prime Minister, informing him that Gonsalves wished to discontinue proceedings against Cummings, the Parliamentary Representative for West Kingstown. Although Robertson did not disclose what was his response, he hinted that he had given consent with conditions. Robertson, speaking to SEARCHLIGHT by telephone, suggested that Bollers be given the opportunity to respond first to claims that Cummings had accepted Dr. Gonsalves âolive branchâ, because he (Robertson) did not want to taken out of context. Up to press time Wednesday, January 25, efforts to contact Bollers were futile, as he was out of office. intentions to discontinue legal action against them, and requesting written responses from the lawyers indicating if they would accept the offer. 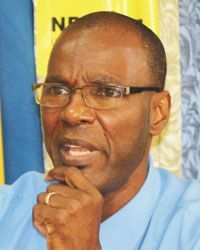 Eustace at an NDP press conference on Tuesday stated that he was having no part of the offer, while Cummings refused to comment on the matter.